Quickly back into bad habits. Just one sketch for the whole month. Flow stone pools along the little creek draining into the Santa Ynez. The night at Dome Springs was quiet once dark came and the not very distant target shooting finished. The morning comes with frost, but it feels like it just barely got there. 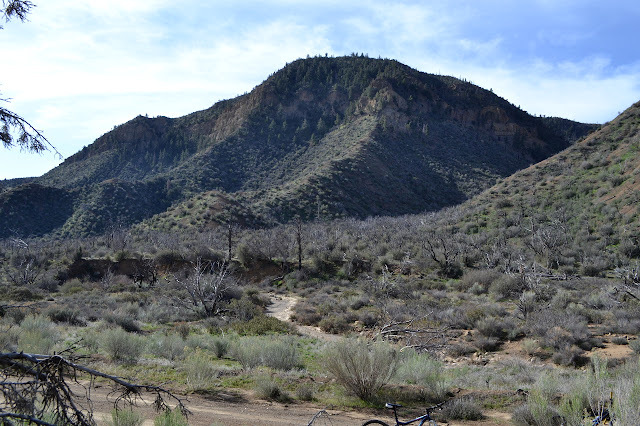 For the morning, we just ride down East Dry Canyon from Dome Springs. This is just along a road I have driven, so I elect to leave the camera. It is a simple ride until we elect to head up West Dry Canyon a little way. Once out into the open wash and starting up the little wash, things do become quite photo worthy. They also become very very sandy. Over and over again, little humps and deep sand cause my wheels to suddenly slide sideways leaving my bike tilted and my weight to one side requiring great effort to keep upright. More usually, it requires putting a foot down. Bruce says just drop it into the lowest gear and enjoy myself and I say this is what feet were made for. There is more trail, but once we reach our goal, we are back. It is a little easier out than in, but not much. Heading down the last of the East Dry Canyon Road, traffic noise out on Lockwood alerts us to the finish of the ride. 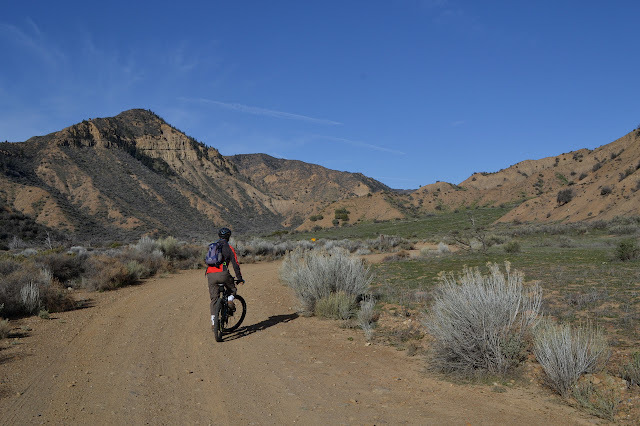 Bruce, a geocacher, has been looking for people to mountain bike with and we agreed on heading out to the area high along the Cuyama River for what turned out to be a lot of little trips. Besides wanting someone to ride with, he also seems to relish the idea of showing someone the ropes of pedaling a mountain bike. My own goals for the mountain bike are downright mundane. I see it as something to get me to the more interesting bit of trail when there is a lock on a road or it is just too rough for a small car. 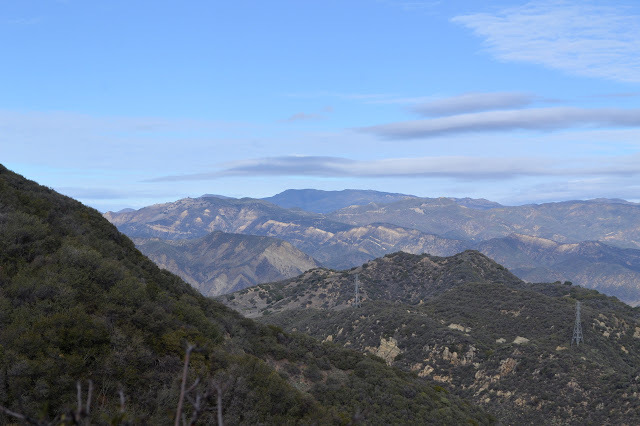 My big goal for the trip is Cuyama Peak with its fallen fire lookout and view. Well, I assume it has a view. My plan to get there is Tinta Creek, which starts off as road, then turns into a motorcycle trail. The climb will finish on another road. 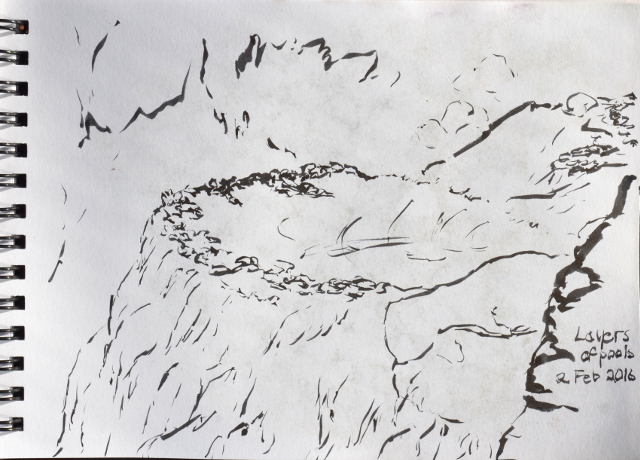 For hiking, I rate the road as "flat", the motorcycle trail as "mostly flat", and the further road as "easy climb". For mountain biking, Bruce rates these a bit higher, not really caring for the 400 feet per mile the final 2.5 miles has. It seems to be more like "reasonable", "getting tough", and "maybe not on the bikes". We decide not to push the vehicles across the river crossing at the start, so end up peddling that initial "reasonable" section but reducing the chance of actually getting up to the top of the mountain. Bruce getting started. After the river crossing, the road is generally nice and smooth. Looking around just a little bit further. It is a little bit of work to get the bike along the rather easy grade beside the creek. After the river crossing, the crossings are all nice fords with cement bottoms. The are also quite dry. The canyon is very slow to narrow as we go until we are at the campground. Dry Tinta Creek and some low hills behind the bike. I decided it was high time I got a little more trail work done. 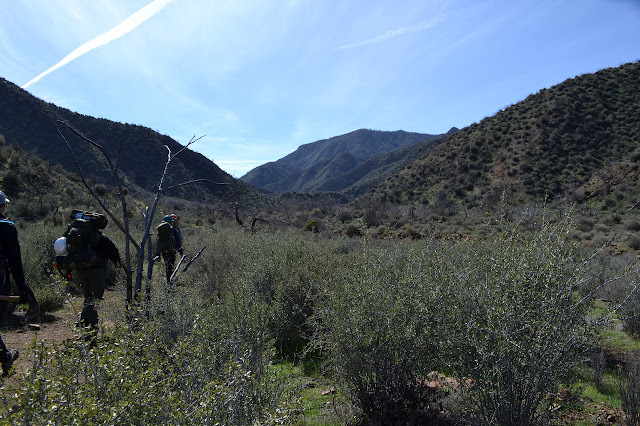 I could not go to the Superbowl Sunday work on Deal Trail, but then found an offer of a three day weekend of work in Santa Barbara Canyon. That could be nice. Arrival time is 9AM. After having to stop by the airport for an early morning drop off and filling the tank with gas, I am barely on time. The road in does offer one confusing moment as there is a corner where I was expecting none, but there are clues which way the public is expected to go. We collect a little bit into the higher clearance cars before filing through the gate and locking it behind us. 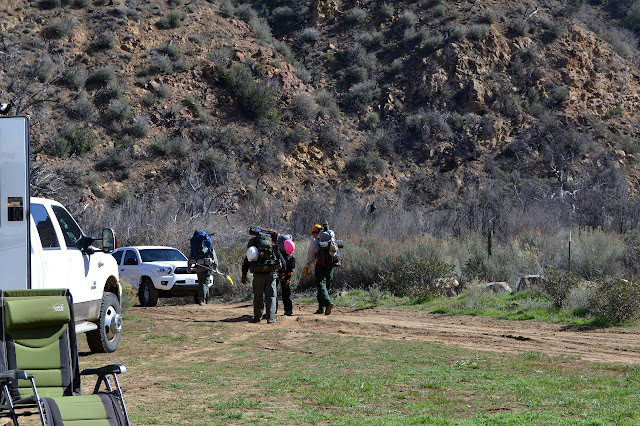 It is only a few miles down the road to the trailhead where our stock support is already set up. We have safety talks for being around stock, brush work, and sawyers since there is a little bit of everything for this trip. It takes a while to get started, but then we gather up tools and hard hats and start off down the trail. Packed up and moving out to make sure the trail goes through. 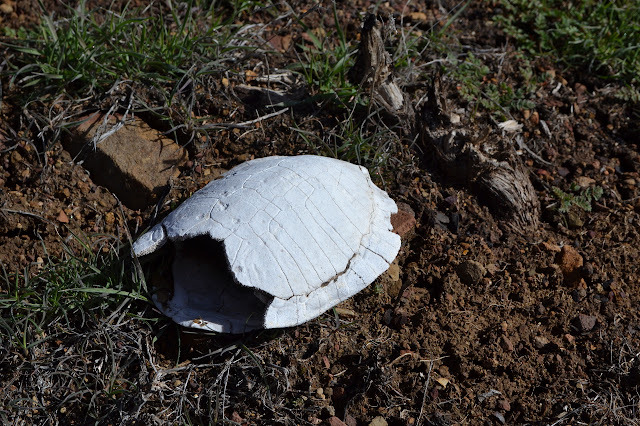 An early casualty along the trail. We do some work on the way up to camp, but mostly we are traveling. It will be easier to move around without all our backpacking gear tucked away in packs on our backs. Headed into Santa Barbara Canyon. The drive up Gibraltar Road may not be many miles, but it sure does take a while. 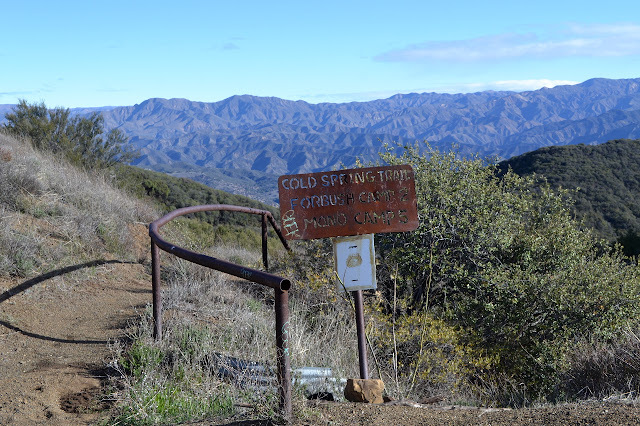 I want to take Cold Spring Trail just a little further than I have before and then use a cross country route out along the ridge and into a little valley. After, I want to finally finish off the trail. All indications are that this bite is entirely too much to chew. I will not know for sure unless I try. Got to be careful with the "upside down" hike, though. It can be easy to get too far downhill to have the energy to go back up. This particular up does not worry me much after all the other hikes in the last few years. First, the easy part down to the old homestead site that is now Forbush Camp. Just five miles to the end of the trail. That is not so far. Little Pine Mountain past the power towers on the low ridge.